Students estimate how many jelly beans are in a jar. They will use these estimation slips to record their answers. 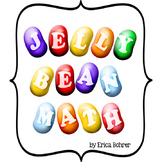 Jelly Bean Math - Eat Your Way Through Math Concepts! 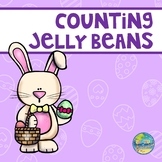 Jelly Bean Math - Great for Easter! 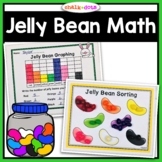 Jelly Bean Math - Sorting, Graphing, Comparing, & More! 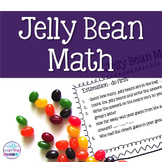 Fun and yummy JELLY BEAN math that includes: Estimate-Count-Compare (More/Less) Activity Sort and Graph Activity Data Analysis Activities (Concepts of greatest, least, & addition number sentences using data) Jelly Bean Measuring Activity Grab some jelly beans and have some fun! 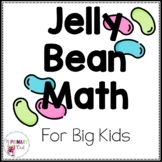 Jelly Bean Math Activities! Graphing, Probability, Data Analysis and more! Jelly Bean Math in FRENCH! 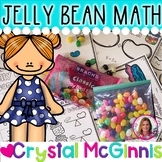 Make MATH a little sweeter with these fun printables and center activities - Just add jelly beans! Perfect for spring and Easter too! You will need to provide your students with jelly beans to use as math manipulatives either in small bags or small tubs for group work. Even bigger kids love jelly beans but sorting by color is just too easy for them! So I created this graphing activity for my third graders, they have to estimate and then use the data to create a tally chart, bar graph and pictograph about their jelly beans. Kids of all ages can enjoy jelly beans! 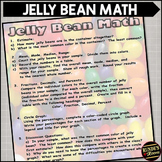 Jelly Bean Math - Version 2 - Great for Easter! Add some seasonal fun to your classroom with this estimation measurement activity. Students build their estimation skills by guessing the length in jelly beans of each item. Students will then use jelly beans to find the actual non-standard length. Happy teaching!